The Soviet Union was at one point the largest nation in the world. It stretched from Europe, the Middle East and into Asia. As a result it supplied numerous countries with arms and equipment of Soviet origin and supplied numerous factions throughout many regional conflicts. 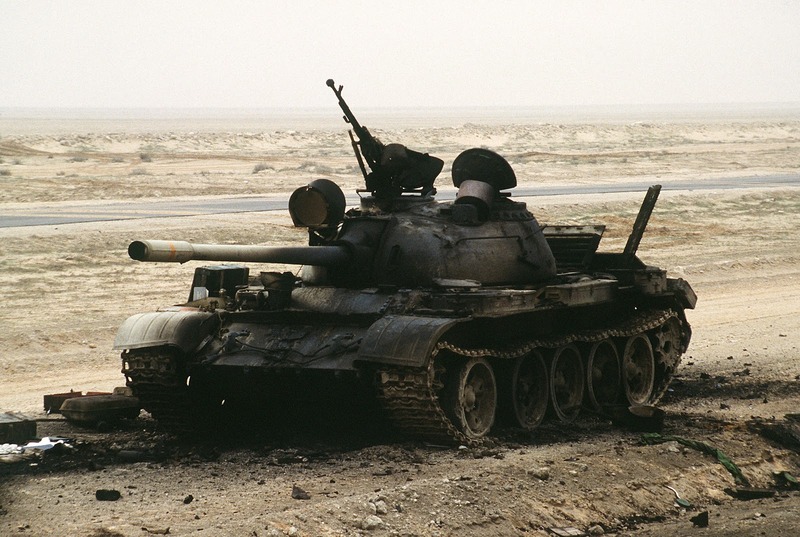 The Iran-Iraq War (1980-1988) saw a large number of Soviet made weapons arming both combatants. During the latter part of the Cold War, the potential for war shifted towards hotspots in the Middle East. With subsequent bombings of the American Marine barracks in Beirut, Lebanon in 1983, Operation El Dorado Canyon against Libya in 1986 and limited American involvement in escorting commercial shipping through the Persian Gulf in 1987, the United States began preparing for the possibility of warfare in the Middle East. A still from a television broadcast of Soviet made Mi-8 Hip helicopters operated by the Iraqi Air Force during the invasion of Kuwait in 1990. After months of tensions in the region on 2 August 1990, the military forces of Iraq commanded by Saddam Hussein invaded neighboring Kuwait annexing it as the 19th province of Iraq. Within 12 hours most of the Kuwaiti resistance had been quelled. By the second day of the invasion, most of the Kuwaiti units had either been defeated by Iraq’s elite Republican Guard or fled into neighboring Saudi Arabia. With its victory over Kuwait, Iraqi forces were now within striking distance of Saudi Arabia, Saddam’s grievances and ridicule of the Saudi government prompted many to believe Saudi Arabia would be next in the cross hairs of the Iraqi war machine. 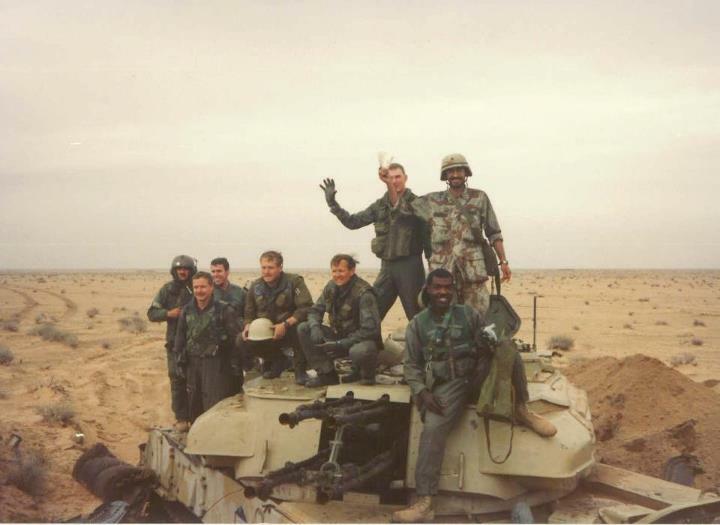 At the request of the Saudi royal family, the first American combat forces began arriving in Saudi Arabia on 7 August 1990 as part of Operation Desert Shield. The nature of the mission was purely defensive initially, but this changed a day later on 8 August when Saddam installed a military governor in Kuwait. 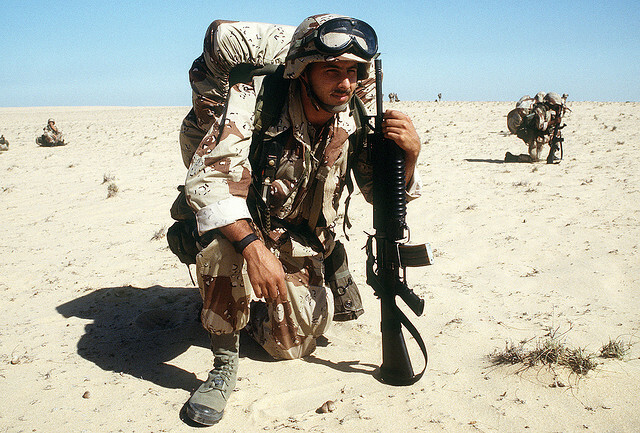 An American combat soldier wearing the Desert Battle Dress Uniform during the initial phases of the Persian Gulf War. 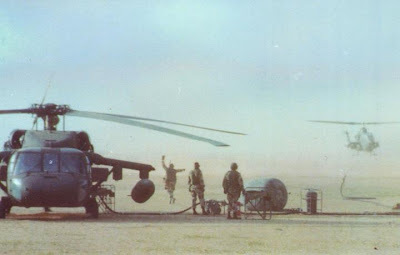 Due to its proximity to the region, numbers of combat troops in Europe were redeployed to the Persian Gulf to implement the United Nations demanded withdrawal of Iraq from Kuwait by 15 January 1991. Fresh off its successes in the Iran-Iraq conflict, the Iraqi armed forces were battle hardened and Saddam refused to remove his forces from Kuwait. On 17 January 1991, Operation Desert Shield became Operation Desert Storm when U.S. Army AH-64 Apache gunships slipped across the Saudi border and destroyed Iraqi radar sites leading the way for coalition strike aircraft to initiate the air campaign against Iraqi positions in Kuwait and Iraq itself. Coalition forces would fly over 100,000 combat sorties against Iraqi positions and drop nearly 88,500 tons of ordnance. With air superiority achieved, the ground war lasting only 100 hours was launched. American and allies forces pressed towards Kuwait City easily overrunning poorly defended Iraqi positions. British forces were sent directly in Kuwait, while American forces went after Saddam’s Republican Guard. Heavy fighting occurred but the Iraqis were repulsed and on 27 February 1991 Saddam Hussein ordered a full scale retreat from Kuwait but not without the initiation of a scorched earth policy in the process. Desperate, Saddam initiated a campaign in which he launched Soviet made SCUD missiles into Saudi Arabia and Israel in hopes of drawing other Arab forces into the war on his side. None would respond. Meanwhile, Combat Forces from the United States, the United Kingdom, and France continued to pursue retreating Iraqi forces over the border and back into Iraq, eventually moving to within 150 miles of Baghdad before withdrawing back to the Iraqi border with Kuwait and Saudi Arabia. On 28 February 1991, a ceasefire was declared with Kuwait having been liberated by coalition forces. The Uniform displayed here was worn by an American serviceman assigned to the United States Army 82nd Airborne Division based in Fort Bragg, North Carolina during the Persian Gulf War. It was the standard combat uniform worn by American forces during the Persian Gulf War. The collar shows the rank tabs of a Chief Warrant Officer 3 (CW3) and the tabs of the United States Army Warrant Officer Corps. Note the tapes are of woodland green pattern sewn against the desert uniform. Unlike the Woodland Camouflage Battle Dress Uniform, the Desert pattern uniform was usually worn with a wide brimmed deserted pattern ‘boonie hat’ or kevlar ballistic helmet with matching pattern camouflage color. Due to cost concerns, the production of this uniform was subsequently discontinued following the end of the Persian Gulf War. The Desert Battle Dress Uniform is made up of a base pattern of light tan overlaid with broad swathes of pale olive green and wide two-tone bands of brown with black on white spots meant to replicate the appearance of rocks. The Desert Battle Dress Uniform would be replaced beginning in late 1993 with a newer pattern known as the Desert Combat Uniform or DCU. American troops stand atop a destroyed Iraqi Army Soviet built ZSU-23 anti-aircraft tank during the Persian Gulf War. U.S. Army Cobra gunships prepare for another sortie against Iraqi armored vehicles and positions inside Kuwait in 1990.